Sonos controllers interact with the players through the HTTP protocol. It is actually possible to directly use this underlying interface to communicate with the players without being limited by the feature set made available in the controller. In order to access this interface, you first need the IP address of the player you want to interact with. It is listed in the "about my Sonos system" menu of the Sonos controller. 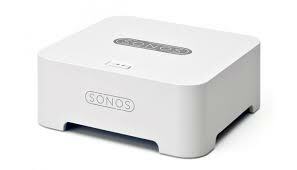 We'll refer to it as <sonos_ip> below. The screen displays a large collection of submenus that you can explore at your leasure. Many of these menus such as 'dmesg', 'netstat', and so on will be familiar to Unix users since they display the result of the corresponding command (Sonos players run the Linux operating system internally). It will print one link per player, as well as one link for the controller and one for the network matrix. The information available under each player name is very similar to the one provided by the status screen of that particular player. I haven't yet looked carefully into the Controller menu. A gray cell means that the Sonos isn't sending data wirelessly between the 2 units. This is expected if the 2 players are connected through a network cable, as the wired connection is typically more reliable and therefore preferred to a wifi path. A green, yellow, or red cell indicate an active path. The actual color is used to encode the strength of the wireless signal. If a unit isn't sending or receiving data wirelessly (i.e. 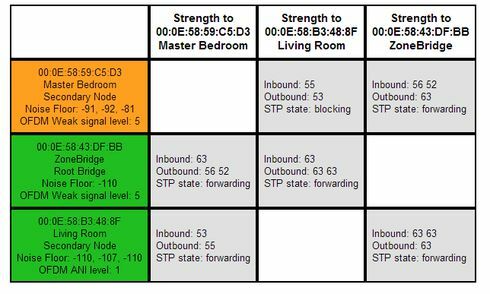 the corresponding row and column in the matrix are both gray) the wireless adapter can be turned off to save power and reduce wireless interference.